My visit to Palawan in the Philippines was eye-opening. I rented motorbikes in El Nido and Coron, and had a blast driving around on my own, going where I wanted at my own pace. In Kuta, Bali, motorbikes are for rent everywhere. If you walk down the street, the ubiquitous touts will keep asking if you want to rent one. Having your own bike frees you from the touts. It also pops the car-and-driver bubble, and forces you to talk to the locals. For my first week I resisted getting a bike. I was locked in my room working. And I didn’t have an international driver’s license. The police in Bali target foreigners on motorbikes, and if they don’t have one they extort money from them. To avoid this I decided to get an Indonesian license, which the locals refer to as a SIM, an Indonesian acronym. There’s two ways to do this: the legit way on your own, or paying the police to “expedite” your license. Jumping through all the required hoops on your own would be difficult because nothing is in English, and the police don’t speak English. I hired a guy who works at my homestay to take me to the police station in Denpesar. He also acted as a translator. I paid him Rp 50,000, and Rp 300,000 to the police, about $27. I think the real cost for a license is only Rp 100,000, but the extra payment included having the correct answers on the poorly-translated written test already circled, and not having to take the road test. Green bike among the green terraces. Unfortunately, my license would only be valid for the duration of my tourist visa. I was lazy during my final days in the Philippines and went to a beach instead of organizing a two month visa. After my first 30 days was up I would be illegal, since I didn’t want to go through this process again. Was it worth it? The police in Bali really are corrupt. I was stopped twice. The first time was in South Kuta. I expected to be stopped there, since there are so many bule around. The poor police officer looked so sad when I showed him my SIM. 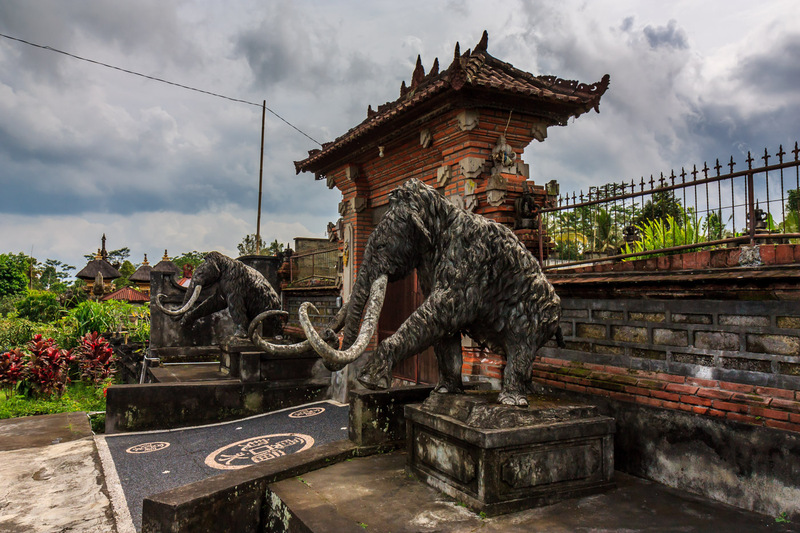 The second time was outside of Ubud. It wasn’t a touristy area, so I was surprised I was stopped. The police also ask for your license when driving onto the ferry leaving Bali. Nobody asked on the ferry back to Bali, or any of the other ferries between other islands. Outside of Bali the police are not corrupt. They never stopped me. They say paying off the police costs Rp 50,000 – 100,000. I never had the chance to test this. Since I was asked to show my license three times, if I would have paid 100,000 each time, that would be about the same price as getting the SIM. Another factor is convenience. It’s safest to only have your payment to the police in your wallet, in case they try to take all the money in your wallet. That means you’d have to hide the rest of your money. That’s what I did when taking the ferry back to Bali, but like I said, there were no police. 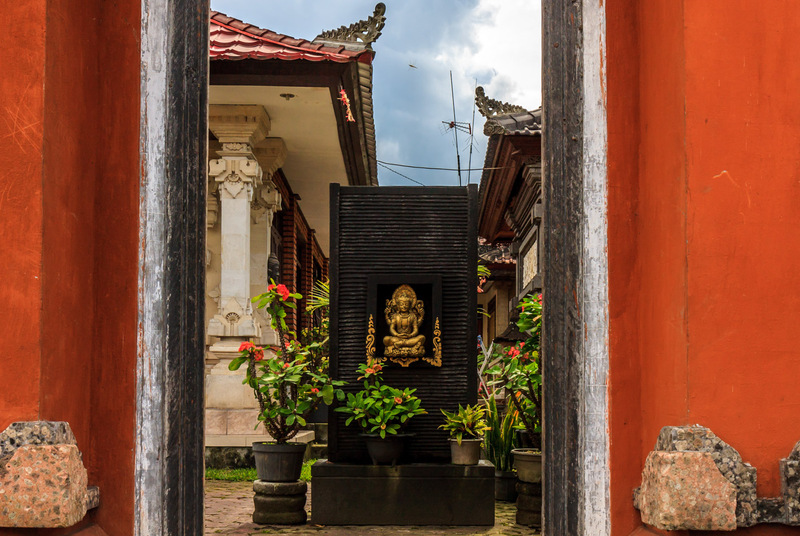 A typical Balinese compound in Ubud. With that sorted, it was time to find a bike. Dirt-biking in the Philippines made me a bit of a motorbike snob. There I rented Honda XRM’s, which are made in the Philippines. These semi-automatic bikes have foot shifters and four gears, but no clutch. I was nervous about the geears at first, but the control was essential on the unpaved roads of Palawan. I wanted the Indonesian equivalent, the Honda Supra. But the only bikes available are automatic scooters like Honda Beats or Varios. Locals guys ride old Supras and will rent them out, but invariably these bikes are in bad condition. I learned this the hard way when I rented an old Supra from the father of the guy at my hotel. It worked fine for a day, then started stalling when I needed to make a left turn. The last thing I needed was to be stuck in the middle of a busy intersection. So the guy at my hotel let me use his personal Honda Beat. I wanted a semi-automatic model because I planned to ride up volcanos. And what about dirt roads? It turns out the little 110cc Honda Beat worked perfectly well on Bali. The roads are all paved. Riding up steep mountains the engine struggled a bit, but it made it to the top just fine. The space for my feet provided ample space for my big backpack. I wore my small pack on my back, which I learned is not comfortable. Bali is tiny so driving distances are short. I would only drive a few hours every day. Still my shoulders started hurting after an hour. Another consideration is the intense sun. Sitting on a bike, the sun is beating down on you for hours. I found it easier to wear a long-sleeved shirt, pants, socks, and riding gloves, rather than deal with sunscreen every day. Once on the road the breeze kept me cool. When you’re driving your own bike, you can stop whenever you see something interesting like this. It was the rainy season, so I needed rain protection for myself and my bags. On this trip I tried covering my big bag with a garbage bag. I’d have to put the garbage bag on every morning, because there’s no way to do it quick once it starts raining. Each bag only lasted one day, because it would rip when I took it off. Mini marts all sell quality ponchos, so I picked one up. My small bag on my back would fit under the poncho. I had a little waterproof bag for the cheap Chinese Android I had to buy in Kuta when my iPhone died, but I didn’t keep it in the bag at all times. I think it got wet because it started acting funny. Driving in the huge built-up area of Denpasar can be pretty crazy. People say the locals ignore laws, but they just have their own rules for driving, which are different from ours. Just go slow, stay to the left, and do what the people in front of you do. There’s often vehicles parked in the left lane, and dogs and people hanging out in the road, so be aware of them. 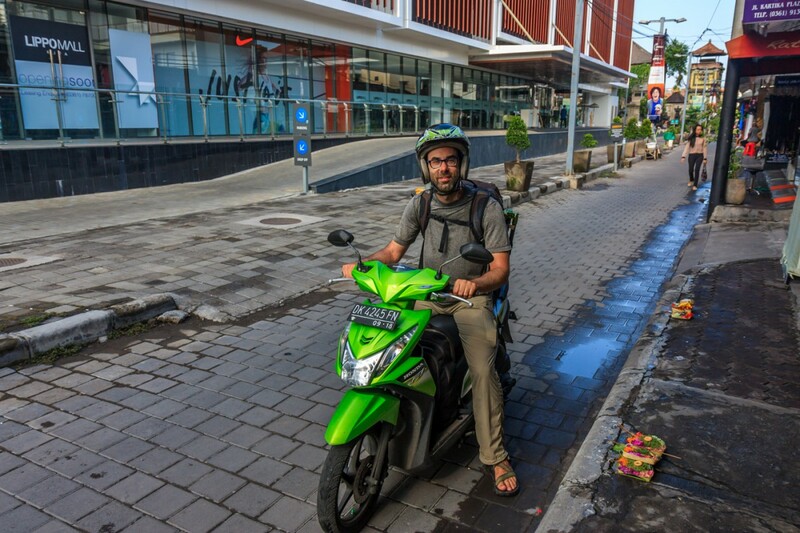 A motorbike is the best way to see Bali. You can go where you want, when you want to, for less money than hiring a private driver.